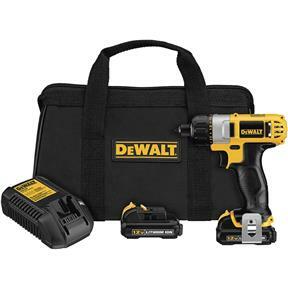 The DEWALT 12-Volt Max 1/4-Inch Screwdriver Kit offers a lightweight body and convenient design features, like shadow-free LED lighting, one-handed loading, and a belt clip. The 1/4-inch chuck accepts bits up to 1 inch. At 6-1/4 inches long and 2.2 pounds, the driver is easy to maneuver in small spaces. The driver comes with two lithium-ion battery packs, each offering 1.1 Ah, and includes multiple torque settings, variable speeds, and a reverse option. At 6-1/4 inches long, this screwdriver is designed to fit into small spaces where traditional drill/drivers don't. As a result, you get straight penetration and avoid damaging screw heads from angled driving attempts. 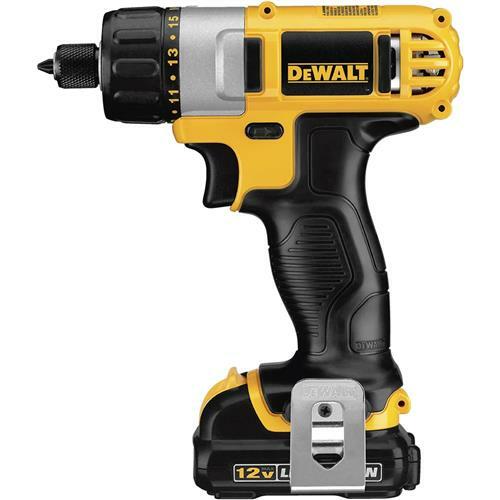 The length of the DEWALT means you can apply maximum leverage, enabling you to get the most from this screwdriver's 160-unit-watt output. Additionally, the DEWALT's three LEDs--mounted radially around the barrel--will light your target area for better visibility. With its 2.2 pounds distributed evenly between its ergonomic body and compact battery pack, the screwdriver is easy to lift and handle. The 1/4-inch chuck can be loaded with one hand, and takes bits up to 1 inch. The DEWALT features a built-in belt clip, multiple torque settings, variable speed, and reverse for additional ease of use. Includes 2 12V MAX Li-ion battery packs, fast charger, belt hook, and contractor bag.